In the New York Times yesterday, we found out that the omega 3 essential oil that you can find in fish, which is beneficial to your heart health, among other benefits, is not as healthy for your heart as eating fish. Are you surprised by this? You might be, because if you look at ads for fish oil supplements, the boxes and bottles are emblazoned with health claims. Studies show…that eating fish is good for you. Studies show…that the reason is a nutrient called “omega 3 fatty acid”. Your body cannot create omega 3 fatty acid, even though it is an essential oil for your normal bodily function. You must get omega 3 fatty acid by eating it. Therefore….SCIENCE created a capsule that contains something that resembles a liquid, and it contains some omega 3 fatty acid. Surely supplementing your omega 3 fatty acid deficient diet of processed foods will yield all of the benefits of actually eating real foods that contain this essential oil in the natural concentration, and surrounded by the natural other ingredients that don’t as yet have a scientific name because we do not yet know they are important. 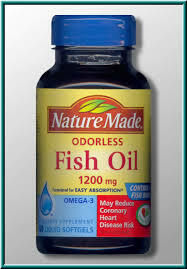 In other words, if you are a person who is living life on the wild side, and your diet, weight and family history show that you are at greater risk of having a ‘cardiac event’ then eating fish oil is no magic shield against your life. Just taking a supplement is not going to fix your problems. Eating foods that contain it naturally might, though. In theory at least, there are good reasons that fish oil should improve cardiovascular health. Most fish oil supplements are rich in two omega-3 fatty acids — eicosapentaenoic acid (EPA) and docosahexaenoic acid (DHA) — that can have a blood-thinning effect, much like aspirin, that may reduce the likelihood of clots. Omega-3s can also reduce inflammation, which plays a role in atherosclerosis. And the Food and Drug Administration has approved at least three prescription types of fish oil — Vascepa, Lovaza and a generic form — for the treatment of very high triglycerides, a risk factor for heart disease. Would you look at that, the FDA has approved a ‘prescription strength’ fish oil. LOL. You do know that the FDA does not test drugs for actually doing what they say they are going to do, right? They test to make sure that it will not kill you or screw something else up. Seems that fish oil ‘prescription strength’ capsules are not doing any harm, so…. Some of the earliest enthusiasm for fish oil goes back to research carried out in the 1970s by the Danish scientists Dr. Hans Olaf Bang and Dr. Jorn Dyerberg, who determined that Inuits living in northern Greenland had remarkably low rates of cardiovascular disease, which they attributed to an omega-3-rich diet consisting mainly of fish, seal and whale blubber. See where correlation can lead you? Eskimos have low heart disease rates, and eskimos eat mostly fish and blubber, and fish and blubber from whales is chock-a-block full of omega 3 THEREFORE, omega 3 causes low heart disease rates. To say that the only difference between the diet of you and me and Nanook of the North is fish and blubber is a staggering logical leap. You might just as easily contend that the fact that the Nanooks of the world ate ZERO CARBOHYDRATES for their entire life caused a low incidence of heart disease. Wait a minute, I have said that for the last year, non-stop! Omega 3 fatty acid is essential. Taking it in little capsules or by the spoonful is proven to be a waste of your time and money, but it’s not killing you–so knock yourself out. If in addition to your daily oil eating you also eat meats (pork, beef, and chicken) that are raised naturally on their preferred forage then you are also getting all the omega 3 you need, but from a natural source, one that will give you the essential oil in the expected ratio to omega 6 oil to be beneficial to you. If you eat butter that is from a dairy where the cows eat their preferred forage you will also get a healthy dose of omega 3. If you eat eggs that come from chickens that live along side of healthy cows and pigs, their eggs and meat will contain omega 3. If you eat fish that were wild and ate bugs and other plant eating things they will contain omega 3. If, on the other hand, you eat meats that lived the miserable last few months of their lives on GMO corn, GMO soy, or gummy bears if gummy bears are cheaper than corn or soy, then you are going to be getting too much omega 6 and not enough omega 3. If you eat a lot of processed foods that are based mostly on grains like wheat or corn you are going to be getting too much omega 6. If you eat like they want you to in the fast food ads and judging by the quantity of processed food at your grocery store, you are not going to get enough omega 3, and you will get too much omega 6. This is known and proven to contribute to heart disease. Taking omega 3 capsules will not correct this situation. You must quit eating processed foods. You must begin eating real foods, you must find a source of naturally raised meats and fish, if you want to gain the benefits of omega 3 and curb your consumption of omega 6. Like many cardiologists, Dr. Stein encourages his patients to avoid fish oil supplements and focus instead on eating fatty fish at least twice a week, in line with federal guidelines on safe fish intake, because fish contains a variety of healthful nutrients other than just EPA and DHA. “We don’t recommend fish oil unless someone gets absolutely no fish in their diets,” Dr. Stein said. I don’t know why they don’t tell you to eat natural meats, too, just fish. It’s probably because the health system is still hung up on the since-debunked theory that red meat or saturated fats are heart-harming. They are not. I don’t know why the prescription is to eat way less carbs, because doing so does not hurt you any more than taking fish oil does. I contend it does not hurt you at all. I just completed a month where I ate nothing but meats, three meals a day. The meats were natural. They contained omega oils, in the correct proportions. Your results may vary. This entry was posted in Health, Living and tagged atkins diet, best diet, carbohydrates, cardio-vascular disease, Change for the Better, dietary supplements, eating healthy, Eating Right, FDA, fish oil, healthy eating, heart disease, omega 3, omega 6. Bookmark the permalink. I enjoyed the meat only month posts, especially the ye olde cookery booke post. My partner of 14 years had a heart attack on March 4 at age 55. im a young thang in comparison at 47, but my weight has been rising very slowly over the years and I would like to drop a few.. My man is ok now, thank goodness. We are not eating much red meat but we eat wild salmon, wild flounder, and wild swordfish a lot. Post heart attack you will get diet change recommendations that are not science based. If you read “good calories, bad calories” you will find that all of the science that smeared red meat and saturated fats was the interview style. The links between meat and fat to heart health are only correlations. By coincidence my own mother had a heart attack last week. I am counseling her to give up carbs, not fats despite the advice her doctors may give her. Yesterday I wrote about creeping weight. I will keep reading and writing. Thanks for your ever-welcome thoughts.